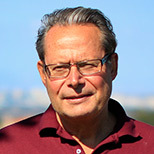 Peter Kareiva is the director of the Institute of the Environment and Sustainability at UCLA. Before coming to UCLA, Kareiva was the Chief Scientist and Vice President of The Nature Conservancy, where he was responsible for maintaining the quality of over 600 staff engaged in conservation science in 36 countries around the world. He is also the acting director of Science for Nature and People (SNAP), a new scientific collaboration among the Conservancy, the Wildlife Conservation Society and the National Center for Ecological Analysis and Synthesis that is designed to rapidly respond to critical questions involving nature and human well-being.